And our 90 minute taxi ride from Stone Town! Sipping on a chilled mango and pineapple cooler on the sunny terrace at the rear lulled me into such a dreamy stupor, that all I have to show for our fabulously fresh seafood lunch of crisp fried mixed seafood, queen prawns marinated with garlic and olive oil, and a shared pasta served with crispy prawns spiced with Zanzibari vanilla, is a pile of prawn heads on R’s plate. I recovered in time for my dessert of pineapple flambé with cinnamon and coconut ice cream, but I clearly have no career in food blogging! A young couple, soaking up the sun on the terrace long after lunch, asked us if this was one of the most beautiful restaurants we had eaten in. It was. I only wished we could have waited for the tide to turn. Prior reservations recommended through their website. Dress code is very casual. Oh my gosh .. that’s a restaurant out on that rock … and a wonderful experience, too! Cheers to your find!!! Yes it is! And the food was surprisingly good. Wow so jealous. Looks an awesome place. 🙂 I want to visit Tanzania one day, but its not in the horizon atm. 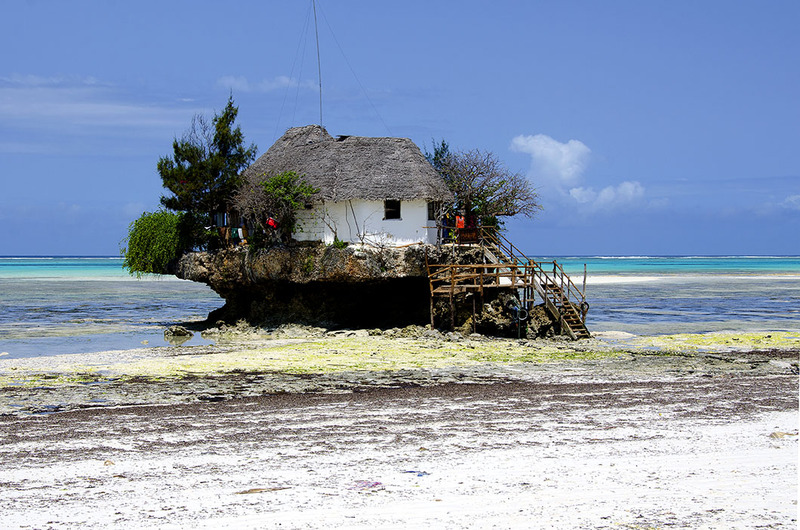 Did you do any safari as well as Stone Town and the beach? Zanzibar was our last stop at the end of a strenuous eight day safari across Tarangire, Ngorongoro and the Serengeti, so we didn’t do much there. This was the farthest we ventured from stone town. Very Sally. I have never seen waters that saturated turquoise before. One of those unique experiences, Madhu. Those views are dreamy and worth the trip there. Any wading involved? We never made it out out of Stone Town. The setting is indeed stunning Norma. Bama, I think it might have started out as a simple shack. I found pictures online from 2011 that has open sides and log furniture. Whoever thought up the full fledged restaurant concept is indeed a genius 🙂 Zanzibar is a beach lovers paradise. There is no dearth of pristine beaches here or fancy resorts. Right up our children and grandchildren’s alley. What a perfect dream location! Gorgeous pictures! Thanks Sandhya. It is an amazing setting. What a unique and beautiful restaurant. Indeed Maralee! The link above leads to a list of more restaurants in even more unique settings! Wow! What an experience to eat there Madhu. So unusual. Yes, one of the most uunusual and beautiful restaurants we have dined in Colline. What a beautiful setting – that water colour is almost unreal! I had never seen water of that shade of turquoise before Lucy. Drooling Madhu, and that’s without the food shots! Ha, ha, you are too kind Patti☺️ But thank you ver much! Wow, that’s amazing. I’d love to live in a little cabin on a rock like that, surrounded by the water. The pictures look like paradise. Wow! Now that’s a dreamy restaurant! What an amazing restaurant, and right there in the middle of paradise. 🙂 Even your photo of the remnants of R’s prawns, has made my mouth water. Your dessert looks like the perfect ending to a meal. Thanks Shelley. We had some lovely meals there as well. There are some really nice places we have eaten on tours in Indonesia but this tranquil spot would have to trump those. Must be famous because I’ve seen a picture on one of the many forwards I’ve seen in the past. Trumps anywhere else I have eaten at Ian. I think it was featured on an Antony Bourdain show as well. Sounds like paradise Madhu. Especially as I’m sitting passenger in London morning rush hour traffic. If I could transport myself right now it would be into that little boat on those clearest, bluest of seas. Wow, that looks like an amazing place! Great photos. What an awesome and dreamy place, Madhu! I’m a little green with envy, but am very happy you were able to have this experience. 🙂 Your cooler and lunch sounds delicious, too! A restaurant on a rock? Awesome! The Rock & it’s fare look amazing……and oh, the beauteous blues of the sea & sky, perfectly encapsulated through your camera lens. I’m looking forward to the sequels to your safari………….I could almost inhale the sea & spices of Zanzibar…..! ok. game’s over. you win hands down. that is surely the most unique and lovelly spot to dine on the entire planet! so glad that you were there — you deserve all things great! Oh what an exotic dream locale. And great to know it foes really exist. Many thanks Madhu for presenting this treat to us. Any other restaurant must pale in comparison. A dream, Madhu. I never remember to take photos of my food. When were you there? What a unique find and wonderful photos Madhu! I’m all for unique dining experience. Cool one, Madhu. I do not think I would have budged from that rear patio. Great place! How to find all of the cool places, Madhu?